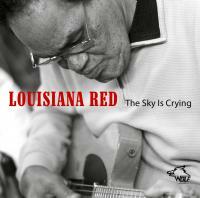 It’s been just over two and a half years now since blues guitarist, harmonica player, and singer Louisiana Red passed away, but our friends at Wolf Records are helping to ensure that Red’s legacy continues to live on with The Sky is Crying, a new release of live material compiled from shows Red performed throughout Greece during the decade prior to his death. In addition to covers of classic blues tunes such as the Elmore James title track, Muddy Waters’ “Champagne and Reefer” and “What is That She Got”, the standard “Early in the Morning”, and Willie Dixon’s “Same Thing”, the album also includes plenty of great original tracks, from the solo “Too Poor to Die” with its quiet “Hoochie Coochie Man”-style riffs on electric guitar to the shuffling closer “I Done Woke Up” that finds Red joined by the Backbone Blues Band as well as Johnny Nicholas on piano as Red wails away on Mississippi saxophone in homage to harp mentors Big Walter Horton and Little Walter, and this track, a slow country blues number that features some fine playing from Red alongside fellow National steel guitarists Bob Brozman and George Pilali, making these lyrics just one of the factors that help to establish this song as such a gem. keep on playin’ the blues. This entry was posted in Albums, Lyrics and tagged Bob Brozman, Johnny Nicholas, Louisiana Red. Bookmark the permalink.